Mozilla Firebird has grown from its modest beginnings as an offshoot of the mainstream Mozilla project to become the centre of the Mozilla Foundation's future strategy. In the past, development has sometimes been tumultuous: weeks of furious activity have often been followed by periods of almost no change at all and at several points the project has come close to death. Fortunately, Firebird development has been rapid in recent weeks as the program makes the last remaining changes necessary for it to become the default Mozilla browser, which is likely to occur in the 1.6 timeframe. Until recently, one feature present in the Mozilla Application Suite but not available in Firebird was support for webpage content in the Sidebar. For a long time, the Mozilla Application Suite has allowed sites to create their own tabs that users can add to the Sidebar. Firebird now has its own implementation of this feature but it works a little differently. First of all, any bookmarked page can be made to load in the sidebar via a simple checkbox in its properties dialogue. In addition, support is also offered for the Mozilla Application Suite's addPanel API, which causes a bookmark that is already set in to open in the sidebar to be created. Furthermore, Opera's method for adding panels to its sidebar equivalent, the Hotlist, is also supported (this method simply involves a normal link with a rel="sidebar" attribute). By creating a link with a target="_search" attribute (named for compatibility with Internet Explorer), a site can cause a page to be loaded transiently in the sidebar, with no bookmark being created. The sidebar bookmarks feature evolved during development and deviates from some of the design documents available on the Web. Originally, the moniker Web Panels was used and the functionality included a Page Holder, which allowed users to temporarily place the current page in the sidebar, with a button available to create a full sidebar bookmark if desired. Later on, the Page Holder was separated from the sidebar bookmarks feature and then removed completely. However, it may return, either as part of the default build or as an extension. Another Mozilla Application Suite feature that has recently been reimplemented in Firebird is a selector for alternative stylesheets. 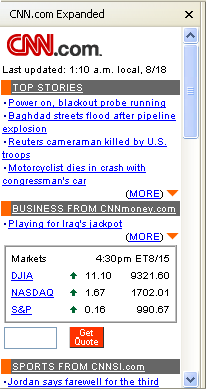 When a page specifies one or more preferred or alternative stylesheets, Firebird displays an icon on the Status Bar. 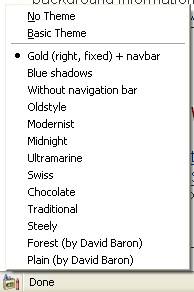 Clicking on this icon brings up a list of the preferred and alternative stylesheets, as well as a 'Basic Theme' item, which applies only persistent stylesheets, and a 'No Theme' option, which causes all external stylesheets and embedded stylesheets to be ignored (though inline styles are still applied). In the future, Firebird will remember which stylesheet is selected and automatically reselect it when the page is revisited. Firebird's Options dialogue has also received some attention recently. The Fonts & Colors and Connection panels have been removed (their settings can now be accessed via buttons in the Web Features and General panels respectively), leaving space for two new panels: Downloads and Advanced. The latter panel supplies a UI for several features that have never had one before, allowing users to configure tabbed browsing behaviour and enable/disable functionality such as smooth scrolling and automatic image resizing. The Downloads panel features preferences for specifying where downloaded files should be placed and also allows the configuration of helper applications. In addition, there's a button that opens the new Plug-Ins dialogue, where users can configure what happens when they open a file that is not natively supported by Firebird but can be handled by an installed plug-in. 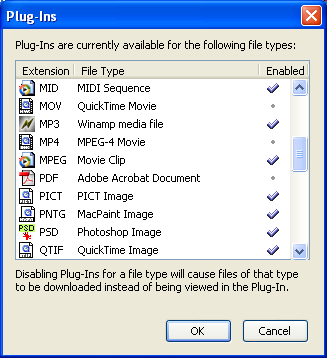 Users can disable plug-ins for certain file types, causing content that would normally be opened with a plug-in to be passed to a helper application or downloaded instead. This dialogue does not affect files embedded directly into a page (for example, by using an <object> tag), which will always invoke their associated plug-ins. If any of these changes have convinced you to download a recent build, you can get the latest nightlies for Windows, Linux and Mac OS X from ftp.mozilla.org/pub/firebird/nightly/latest-trunk. Many Linux users will be pleased to find that builds compiled with GTK 2 and XFT are now available. The usual disclaimers about crashes, loss of data and the stealing of your girlfriend apply.